Optical Mark Recognition or OMR is the latest trend when it comes to software technology.Base OMR is a product of Gravic’s Remark Company which is considered as the leading brand when it comes to your data analysis needs. The company provides an array of products to choose from in order to streamline your data evaluation process on reviews, entrance examinations and even web based surveys. •IT IS VERY EASY TO CREATE A TEMPLATE. •YOU SCAN A FORM, THE SOFTWARE DISPLAYS THE IMAGE OF THE FORM AND WITH THE MOUSE, YOU DRAG "BOXES" AROUND THE AREAS OF MARKS AND FILLS IN SOME INFORMATION ABOUT THESE AREAS. INSERT RESPECTIVE FIELDS TO RETRIVE APPROPRIATE DATA. FOR EX: INSERT BARCODE FIELD TO READ BARCODES, IMAGE FIELD TO CORP IMAGES ETC. SAVE THE TEMPLATE FOR FUTURE REFERENCE. ACE OMR SAVES THE TEMPLATE IN (.BOMR) EXT. LATER YOU CAN EDIT THE TEMPLATE TO MAKE CHANGES. Base OMR IS FORMS-PROCESSING SOFTWARE. ACE OMR RECOGNIZE OPTICAL MARKS (OMR), OPTICAL CHARACTERS (OCR), BARCODES (BCR), IMAGES. ACE OMR RECOGNIZES DATA WITH YOUR IMAGE SCANNER AND ANALYZES THE DATA OR EXPORT THE DATA TO THE APPLICATION OF YOUR CHOICE. 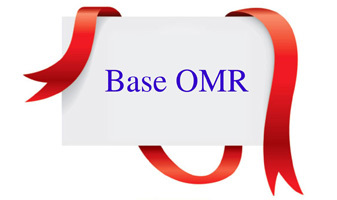 Base OMR IS SIMILER TO OMR SCANNERS LIKE SEKONIC, DRS, AND SCANTRON ETC. BUT IT RECOGNIZE FORMS WITH THE HELP OF SCANED IMAGES. ACE OMR WORKS WITH THE HELP OF TIMING MARKS. WITH THE HELP OF TIMING MARKS AND COLUMN YOU SPACIFY IN THE TEMPLATE, ACE OMR PICKUPS THE DATA.